WL's 200 mW "Spyder I Pro" - the unbiased review! How do you think of my review? Wicked Lasers 200 mW Spyder I Pro - the unbiased review! This product has been discontinued as of July 2010. 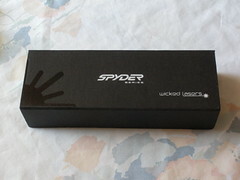 Wicked Lasers recently sent me a Spyder I Pro for evaluation. Below is the review I promised Steve. I hope you enjoy reading it as much as I did writing it. Skip to the end of this boring review for pictures and videos. Full disclosure: Though I received this laser at no charge, I've done my best to be impartial. I didn't sugarcoat the review in return for a free product, nor did I give it a lower rating than it deserves simply because Steve and I weren't on the best terms. The classic Spyder is back - with a vengeance! Free samples come in the mail every so often. They tend to be cheap items like razors, jelly beans and pain relievers. However, things can get pretty crazy when said sample is a 200 mW laser capable of destroying stuff. To cut to the chase, the CEO of Wicked Lasers has been sending samples to members of various forums in exchange for reviews. I was one of the lucky recipients. This was something I had least expected, especially considering that I've been one of the company's biggest critics in the past. For those who want to know the details, I'll be blunt: Wicked Lasers had a bad reputation over the last two years due to numerous complaints about defective units. People have also been banned from the official forums without cause, myself included. Yet recent reviews suggest the company has been working hard to improve its quality assurance and restore its image. I strongly believe in second chances and gladly accepted Steve's offer. After all, we're only human, and humans make mistakes. As is normal for Wicked Lasers, shipping was extremely fast. 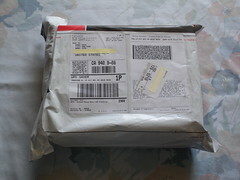 The package was sent out Monday evening and delivered to my doorstep Thursday afternoon. Anticipating the UPS truck was like being a kid waiting for Christmas. I could hardly contain my excitement. The Spyder I Pro is a complete redesign of the original Spyder product line, the latter of which was discontinued in early 2007 following the launch of the Spyder II in December. Due to popular demand, Wicked has brought back the original series and given it a new appearance. The Spyders aren't the only lasers receiving a makeover; the other products will also have upgraded versions as part of the company's new initiative. The most obvious differences between the classic Spyder and the upgraded version are the switch location and new safety dongle; these will be covered later. The price hasn't changed much; the original 200 mW green Spyder was sold for $999.99 while the new model is only $2.02 cheaper. But what makes the Spyder I Pro a better deal is that it comes with 15,000 Wicked Bucks, equal to $150 in store credit. 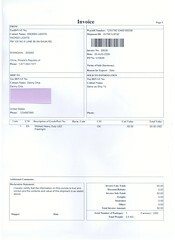 One could spend an additional $197.97 to extend the warranty from three months to two years. The laser comes in a cardboard container with embedded magnets that hold it shut. The problem is that cardboard is relatively fragile and easily crushed during transportation. Given the $997.97 price tag, an aluminum or plastic case would have been nice. Those who want better protection may consider looking at specialized carrying cases. 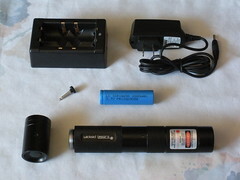 The Spyder I Pro itself is much larger than an average laser pointer and weighs quite a bit. You could probably knock someone out with this thing - not that I'd recommend it. The host has an anodized finish that makes it resistant to scratches. The engraved Wicked Lasers logo is also a nice touch. Despite its size and weight, the laser feels slick and fits comfortably in my hand. The laser was covered in what appeared to be foam shavings and metallic powder upon arrival. I spent several minutes cleaning it before turning it on for the first time. There was also gunk in the joints; I was able to scrape some of it off before stopping out of fear of scratching the anodized finish. This minor problem doesn't affect the performance but is nevertheless something I could do without. Cosmetic issues aside, the laser gets high marks in the looks department. The Spyder I Pro uses a single 18650 lithium-ion cell, typically rated at 3.7 volts. These batteries generally aren't used in consumer electronics and can be difficult to find in stores. That wasn't a problem in my case: Wicked Lasers has kindly provided a fresh one, along with a DSD charger. 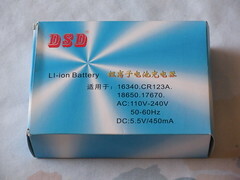 This particular battery has a nominal capacity of 2,000 mAh and lasts about 90 minutes. 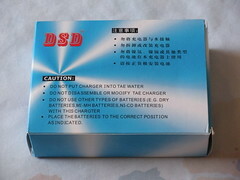 The quality of the battery and charger won't be covered in this review as they were made by other companies. A nice feature of the Spyder I Pro is its unlimited duty cycle. Users can leave it on indefinitely without the risk of overheating. The constant-on switch allows the power to stay on until the button is pressed again. This can be useful, especially when one wishes to observe the beam from a distance. Of note is that the switch is now on the tail cap. I find tail-cap switches to be less convenient, but this is more of a personal preference and won't figure into the rating either. Unlike the original model, the Spyder I Pro is compliant with FDA regulations. 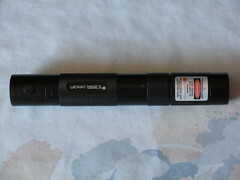 Older rules required lasers above class IIIa to have five safety features, namely an indicator light, safety dongle, aperture shutter, emission delay and key switch. The rules have since been relaxed; according to Steve, only the indicator light and interlock are currently needed for FDA approval. The Spyder I Pro meets both of these requirements but has none of the now-optional features. This means the annoying emission delay is now gone, although laser enthusiasts may miss the aperture shutter, which has the side benefit of keeping dust off the lens. The indicator light is a small red LED that turns on when the laser is running. While this feature is required for class IIIb and IV lasers, the 200 mW of green goodness makes it redundant except when the user is wearing goggles. This isn't to say that indicator LEDs are useless; in fact, they're absolutely essential for invisible wavelengths. The interlock must be inserted for the laser to power on. The nice thing about the dongle is that it's inconspicuous and doesn't stick out like a sore thumb. Yet there is one frustration: sometimes it can be difficult to insert the interlock with the battery in place, although temporarily removing the tail cap solves the problem. For the purpose of preventing accidental activation, the interlock does its job pretty well. On the subject of safety features, I'm surprised no protective goggles were provided. Considering that even a 15 mW laser can cause permanent eye damage, one can only imagine the dangers of a 200 mW one. Given the power of the Spyder I Pro, eye safety is of utmost importance. Even though I already own a set of 532 nm LaserShades, I feel they should be included with every purchase - which is what Wicked Lasers used to do. 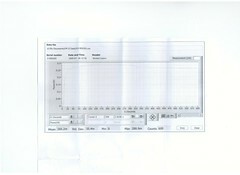 The laser has an average output of 266.2 mW and peaks at 288.9 mW according to the included power graph. This is difficult to confirm as I don't have a laser power meter. However, the observations leave little doubt. The inverse-square law means the apparent brightness of a laser is proportional to the square root of its power, assuming everything else remains the same. 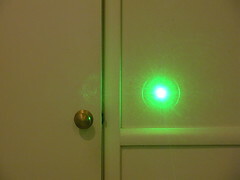 As is expected for a 200 mw green laser, the dot is incredibly bright. 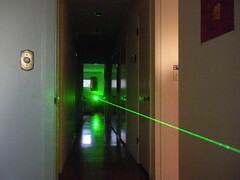 The beam is visible in a lighted room and easily outshines that of the 35 mW laser I got two years ago. The Spyder I Pro is even more visually impressive at night. It pierced the heavens with a thin beam of 532 nm light - obviously after I made sure the sky was clear of aircraft. I then tested its range and was able to reach most of the clouds. Pictures don't do it justice at all. 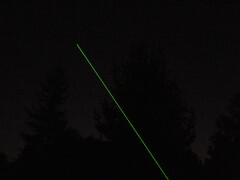 The beam is about 1 mm wide at the aperture and has an approximate diameter of 28 mm at a distance of 15 m. This corresponds to a divergence of 1.8 mrad - which is higher than the advertised 1.5 mrad but not unexpected because the beam diameter is inversely proportional to the divergence due to diffraction. One can see there is a trade-off. Of course, that leaves a burning question: how well does the Spyder do what we really want it to do? First was the classic match test: the laser effortlessly ignited a match that had been colored with a blue marker. I then pointed it at a red balloon that met its demise less than two seconds later. A fully inflated balloon would have popped even faster. The Spyder also cuts through black electrical tape in about 40 seconds. Last but not least, I decided to be stupid and stuck my finger in the beam - and promptly felt a sharp sting. High-powered lasers like the Spyder definitely come in handy should you want to impress members of the opposite gender. Having said that, you should always take safety into account as these things aren't toys. Although the Spyder I Pro is solid and reliable, that alone doesn't justify the cost. Despite the awesome features and the $150 credit towards future purchases, the $997.97 price tag is rather high. 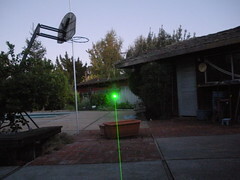 In comparison, one can easily find green lasers with similar outputs for less than $650 elsewhere. The slick and ergonomic design makes this laser a unique product. In contrast to other companies, Wicked makes some of the best-looking lasers and could be considered a luxury brand. The Spyder I Pro is a great choice in terms of design and performance. But when it comes to price, there are better alternatives. Bottom line: Although the 200 mW Spyder I Pro is loads of fun, the price tag is a deal breaker. All photos and videos can be viewed at my Flickr account. The videos are also available on my YouTube channel. I'd also appreciate feedback on my review. Please let me know if you think it's too lenient or too harsh. I'd agree with JL... the LaserGlow Aires 225 is about 1k also. Price seems right. Nice review, price seems right as well. What struck me is the size of Spyder though. I own an identical charger to the one pictured so it is a good size reference. I was always under the impression that it was much larger, seems to be quite "pocket friendly" compared to other non-pointers? Man that output is REALLY stable! The graph does not even fluctuate! It's a good review, I'd rather have the images inside it and not at the end because it makes it look as if it were all text and people don't like to read 1000 paragraphs of text (constructive criticism, just my opinion, you asked for feedback ). Good to know you added pros and cons, although considering the stable output and other companies like opto and laserglow (plus dragonlasers) that sell quality lasers, the price seems right, just look at RPL prices. That was a great reveiw. I hope that all the spyders are going to be like this! Wish WL would send me a laser, haha Anyway great reveiw and it looks like WL is starting to step up there game! It has come to my attention that the number of Wicked Bucks that come with this laser may be incorrect. On the Wicked Lasers website, a lot of lasers are listed as having a reward value of 25,500 Wicked Buckets. I don't think this is the case (unless Wicked wants to lose about $157 every time it sells a $97.97 laser). There seems to be some confusion on whether this laser is FDA compliant. I've checked the new FDA rules, and as far as I'm aware, the laser is indeed FDA compliant. I've reworded the review to avoid giving people the wrong impression. Oh, and I've added some beam shots! My main concern is that Wicked has shipped these lasers knowing the recepients were likely to do reviews. While your review of the unit you received seems unbiased, my main concern is that they might have sent only the very best units to potential reviewers. I don't mean to make an accusation there, but it is a possibility that can really only be excluded by reviews from random clients where the company would have no idea if they'd post reviews or not. For $1000 i think we should expect a 200mW, 532 nm laser to deliver at or above spec under all circumstances by now. The real deal is in bang for the buck, and i honestly think you can get a laser of equal performance for less money, or something with better performance for your $1000. Steve also approached me to test some systems. At no point did he request a review. I won't be posting any review for some time, but when I do it will be because I feel it is the fair thing to do, not because Steve asked me to. I'm a huge critic of Wicked Lasers, but based on what I've seen so far, I think that these new systems from Wicked are top notch. We'll see how they hold up over time, but if these are indicative of how these systems will be in general, one wouldn't get hurt buying one. These aren't o-like modules or anything like that. They are far superior judging by the overall stability and beam characteristics. The argument that these units are intended for review and so must be the best of the bunch is no good. Any product review (other than independent customer reviews) that you see anywhere will be subject to the possibility that an above average unit was sent in to be reviewed. This is no different. I agree. We also need reviews from independent buyers before we can really determine the quality of Wicked's products.